Just a short message to let you know our community has taken note of the work your crews have done in improving the culvert near 281 Ramona. All are impressed with the time and attention you have given to our concerns. The turn around on the work at the culvert is amazing. We are also pleased to have defined the drainage down slope of the culvert to the creek for incorporation into the restoration of Ramona. We are pleased to report that County of San Mateo Department of Public Works (DPW) is being responsive to maintaining Ramona Road and Alpine Road. This is their responsibility and they have shown a great willingness to work with representatives of the Vista Verde and Los Trancos Woods Community Associations. The community volunteer committee brings to bear considerable expertise as you can see by the list of committee members. Attached are detailed notes from our December 20th SARR Committee meeting with the DPW. At the meeting, a number misconceptions were cleared up and a very positive and effective sharing of information took place. The committee, especially the engineers on the committee, continue to work with the county to investigate long lasting and cost effective solutions. To all who sent in signed petitions, thank you. We will keep them on hand. At this point we do not foresee the need to further involve Anna Eshoo or the Board of Supervisors/Don Horsley. Funding for fixes on both Ramona and Alpine thus far seem within the scope of the DPW. We will continue to keep you updated with general status and permitting as work progresses on Ramona and Alpine Roads. On Friday, January 11, 2013, a few of us (Ken Kormanak, Ruth Thor Nelson and Amanda Lee) met with Joe LoCoco, DPW's Deputy Director, Road Services, for two hours at the culvert which overflowed onto Ramona Road on Sunday, December 2. Ken initiated the field trip in follow up to the full Committee meeting with the DPW on December 20, 2012. We wanted to locate and explore the restricted outflow of the culvert drain at its exit point near Los Trancos Creek. Open the attachment for Ken's pictures that provide some good visuals. After hiking down slope, we found that the drain pipe was indeed covered in debris and not visible; the flow of water was the only clue to its location. This drain constriction coupled with accumulated debris at the road-level culvert caused water to back up onto Ramona Road during December’s unusually heavy rains. Due to the drain outlet location, no equipment can access it currently. Joe will have his crew try to expose the drain (a 24-inch RCP/reinforced concrete pipe) using hand tools to define the situation and create a solution. Progress updates will be posted to this website ongoing – click on “Vista Verde > Roads and Signs” menu above to see all publications. At the last Vista Verde Community meeting, the Save Alpine and Ramona Roads ad hoc committee was formed to work in conjunction with the Los Trancos Woods Community Association to work with the County and other governmental agencies to ensure that Ramona Road and Alpine Road slide areas are repaired in a timely manner and sustainably. The committee is also committed to communicating with the community, keeping neighbors apprised of progress. Progress updates will be posted to this website ongoing. Vista Verde Sign Ribbon Cutting Party: Oct. 15! Local businesses, thank you for your generous donations! Read more: Vista Verde Sign Ribbon Cutting Party: Oct. 15! Vista Verde Sign Construction To Begin! We finally made it! Fundraising for the two community entrance signs has successfully concluded and, with the encroachment permit approved, our landscape contractor will begin construction in mid-September. Metal signs will be installed after the rock walls have been built. We are planning to have a ribbon cutting ceremony on Saturday, October 15 followed by a community-wide party. Please save this date for the ceremony and party. Please join me in thanking Claudia Mazzetti and Amanda Lee for their professionalism, persistence, and creativity in making everything happen; while superficially appearing simple, this project has been remarkably complex and time-consuming to execute. I would also like to thank the community members and local businesspeople whose generous contributions made this project possible. I look forward to seeing everybody at the October 15 ceremony/party! David Smernoff and Tom Uridell are heading up the Water Board's water movement control and road maintenance/repair activities. The Water Board has hired BAGG Engineering to develop plans to address the various water movement and road repair issues, and is working with San Mateo County to execute the projects. Major road issues being addressed include those on Ramona Road, Alpine Road, and near the corner of Old Spanish Trail and Vista Verde. The Water Board's water movement control Web page is here. In 2009, Richard Swan and Ken Kormanak put stakes next to Ramona Rd. as a reference for tracking the landslide's status. They measured the distance from the stakes to the top of the landslide area to be 9 feet. Measurements taken after the hard rains in late March 2011 show the landslide is now only 3 feet from the road's edge. See photos below. The photos below were taken by Amanda Lee on 3/27/11. They show the slide on the edge of Alpine just below Joaquin. San Mateo County's road department has inspected the site but we don't yet know what their plan will be. Do you support Vista Verde community entrance signs at the two proposed locations? Click here to go to the sign discussion in the forum. The Community Sign committee presents this update on the Vista Verde sign project. 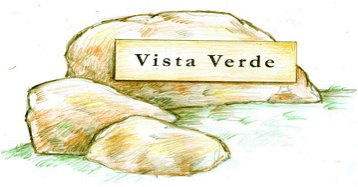 We want to share with the community key points of the discussion about a Vista Verde community sign. Below are some of the factors for and against a Vista Verde sign, some history and some concerns as discussed at the open community meeting. About 27 neighbors attended the meeting for a very cordial, interesting and in-depth discussion. Feedback across the board was that the conversation was valuable and insightful. More than a few changed their initial perception. We have survived for many years without a Vista Verde sign, why should we have one now?